Prophet; author of the eighth in the collection of the twelve minor prophetical books. The etymology of the name of the prophet is not clear. It seems to be a loan-word representing the Assyrian "hambaḳûḳu," a garden-plant (Friedrich Delitzsch, "Prolegomena," p. 84; König, "Historisch-Kritisches Lehrgebäude der Hebräischen Sprache," ii. 1. 473, on the vocalization), and has the appearance of being a writer's pseudonym (F. E. Peiser, "Der Prophet Habakuk," in "Mitteilungen der Vorderasiatischen Gesellschaft," 1903, i. 12). That he was a Levite has been urged on the strength of the postscript to ch. iii. (verse 19, "on my stringed instruments"), which indicates that he owned instruments: only a Levite was authorized to use an instrument to accompany his songs in the Temple. The superscription of the Septuagint apocryphon Βὴλ καὶ Δράκωυ, in the Codex Chisianus, also designates him a Levite. The absence of exact information concerning his life left a vacuum that has been filled by myths and legends (see Franz Delitzsch, "De Habacuci Prophetæ Vita"). The above-named apocryphon makes him a contemporary of Daniel, whom he was miraculously privileged to visit in the lion's den and supply with food. In this Greek story his father's name is given as "Jesus" (Joshua). Jewish tradition makes him the son of the Shunammite woman (see Elisha), but nevertheless a contemporary of Daniel (see "Seder ha-Dorot"; Abravanel's commentary to Habakkuk; Zohar, Lek Leka; Neubauer, "The Book of Tobit," Appendix). Of the many conceits current among the cabalists with reference to this prophet, the most curious was that which declared him to be the reincarnation of Adam. His grave was shown at several places (See Hukkok). Peiser (l.c.) contends that Habakkuk is the pseudonym of a Judean prince held as a hostage in Nineveh, and who witnessed the attack of the Medes, in alliance with Chaldea and Babylon, in 625 B.C. But his book announces a second attack. This prince may have been the son or grandson of Manasseh. 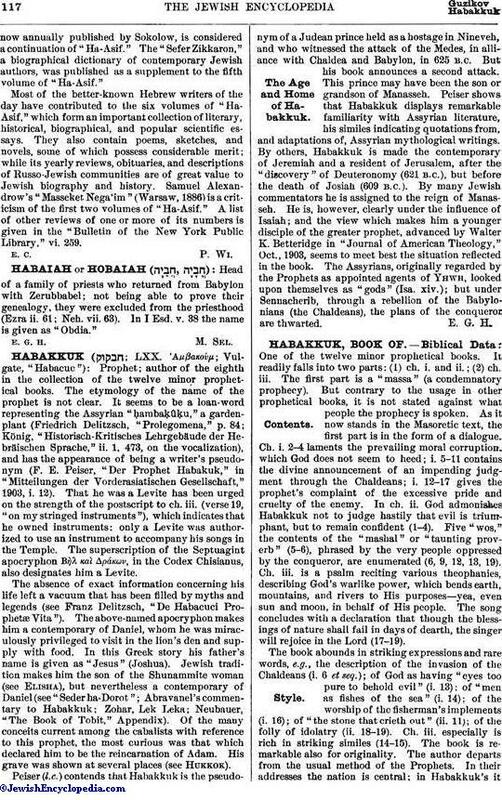 Peiser shows that Habakkuk displays remarkable familiarity with Assyrian literature, his similes indicating quotations from, and adaptations of, Assyrian mythological writings. By others, Habakkuk is made the contemporary of Jeremiah and a resident of Jerusalem, after the "discovery" of Deuteronomy (621 B.C. ), but before the death of Josiah (609 B.C.). By many Jewish commentators he is assigned to the reign of Manasseh. He is, however, clearly under the influence of Isaiah; and the view which makes him a younger disciple of the greater prophet, advanced by Walter K. Betteridge in "Journal of American Theology," Oct., 1903, seems to meet best the situation reflected in the book. The Assyrians, originally regarded by the Prophets as appointed agents of Yhwh, looked upon themselves as "gods" (Isa. xiv. ); but under Sennacherib, through a rebellion of the Babylonians (the Chaldeans), the plans of the conqueror are thwarted.